I took a two day trip to Maine recently, and I shook off a lot of chains in the process. I have a ton of memories of situations that caused me a lot of pain that I’ve been conditioned to avoid. You only have to put your hand on a hot stove once to learn to never do it again. There are many “hot stove” moments in my past. Some years ago I drove a friend of mine to go see her girlfriend that lived an hour away. My friend didn’t have a license, and I had just gotten mine, so I figured a long car trip would be fun. It was about two hours each way, and afterwards my joints were so sore I could barely walk for a few days. This conditioned me to avoid long car trips. I’ve been at concerts where my back will start hurting so bad halfway through the opening act that I can’t stand up anymore. Again, I learned to avoid spending too much time up on my feet. I was able to improve my health a lot the past year or two, so I decided to challenge all of my fears. My situation changed, but I was still playing by the old rules. I need to overwrite these bad memories with good ones. I needed to shake off my chains! I drove a couple hours north of my home state of Massachusetts to Maine. A good friend of mine grew up there, so she gave me plenty of ideas of where to go and we kept in contact by phone during the trip. I visited some beaches, ate some great food, spent hours walking around Portland, and played a couple open mics. Unlike most open mics that only give you 10 minutes to play, the first restaurant gave me 40 minutes! 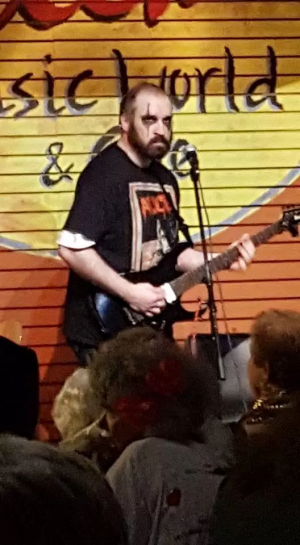 The second bar I played at wasn’t and open mic anymore but I was able to talk my way into playing for 30 minutes. I met a lot of very interesting people that kept me company after playing my music. These were the happiest two days I could remember in recent memory. I was on top of the world. Sure I was sore as hell afterwards, but I just didn’t care. One of the more annoying features of Chronic Fatigue Syndrome is post-exertional malaise. Any physical activity is followed by a long period of immune system flareups. This means a variety of symptoms such as muscle aches, dry skin, nausea, headaches, and other things. Any time I do a lot of physical activity for a long period of time (hours or a couple of days), it is followed by a couple weeks of all of my symptoms flaring up and feeling like I had a bad cold. After my two-day Maine trip, for the first time, I didn’t get sick afterwards. This trip filled me with a lot of confidence for my future. I really needed it. I can’t let past memories of bad experiences prevent me from doing things, I need to constantly challenge my limits. Things change over time, but if you aren’t constantly challenging your limits, you’ll never know what you’re really capable of.